When I arrived for the first time at New York, by that part of the Atlantic Ocean which is called the East River, I was surprised to perceive along the shore, at some distance from the city, a number of little palaces of white marble, several of which were of classic architecture. When I went the next day to inspect more closely one which had particularly attracted my notice, I found that its walls were of whitewashed brick, and its columns of painted wood. All the edifices that I had admired the night before were of the same kind. At that time, the city had barely grown northward beyond Greenwich Village. (Tocqueville wrote in the year the stately Greek revival row was built on Washington Square North between Fifth Avenue and University Place.) North of there, along the East River, New York's elite families maintained their country residences. Sailing up the East River, the houses formed a splendid sight, one after another, gleaming in their whiteness, which stood in such contrast to the prevailing red brick inland and downtown. (The houses contrasted all the more with the dour brown sandstone that would soon become ubiquitous in New York.) While the stateliest of the Grecian row houses used white marble trim, it would be a good ten years more before New York got any buildings with full white marble façades. Tocqueville might well have thought he gazed upon marble, for the whitewashed clapboard was a kind of stylistic prolegomenon to the marble revolution of the next decade. 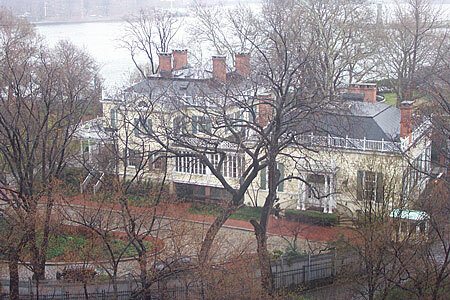 The only of the riverside mansions still standing that gives us any sense of what Tocqueville saw, and that indeed Tocqueville saw, is "Gracie Mansion," the house built in 1799 (and added to thereafter) by Archibald Gracie. Gracie was a Scotsman who owned a fleet of merchant sailing ships that plied the Atlantic. The transatlantic cable was still several decades in the future in 1799. The only means of communicating across the ocean was to write a letter, put it in a burlap sack that got thrown aboard ship, wait for the ship's hold to fill and for the weather to turn propitious (scheduled packet shipping was two decades away), then send it across the ocean. In 1799, the exchange "I love you"-"I love you, too" could take four months to complete. It was a different world. World wide web? Ships like Gracie's were as close as we got. When some of Gracie's ships (if I have the story right) were impressed by Napoleon's navy, Gracie couldn't make up the lost revenue, and was bankrupted. It must have been a mighty fall from grace for a man known for the sophisticated entertainments at his country retreat. Washington Irving was a guest at the country house, so too was Louis Philippe, future king of France under the July Monarchy. Heady house-guests, I'd say. After Gracie the house endured a series of ownership till in the early 1940s Robert Moses, apparently, suggested it be made the official residence of the mayor of New York. 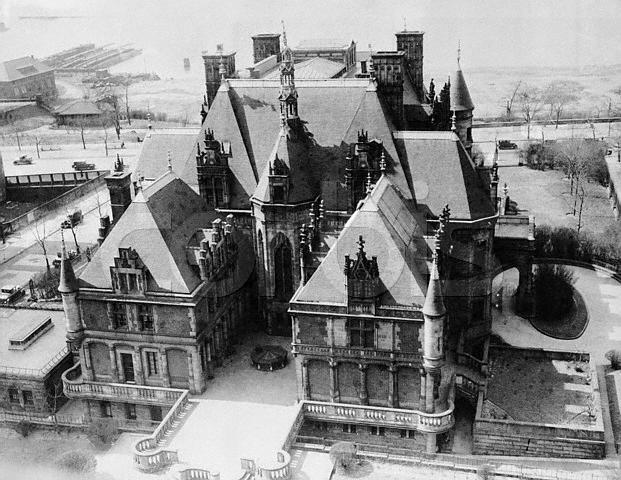 The mayor at the time, La Guardia, was first shown the extraordinary Charles Schwab mansion on Riverside Drive. The Little Flower could scarcely conceive of himself in that improbably ornate mansion. But when shown Gracie's house, the mayor felt he could be comfortable there, in a house embodying the "republican simplicity" of the early "federal" period of our national architecture. Please note that both the Schwab mansion and the Gracie house partook of the vocabulary of classical architecture. Classicism is a fully formed language, not a style (or is a language comprising styles), capable, like the English language or the French language, of an infinite variety of expression. 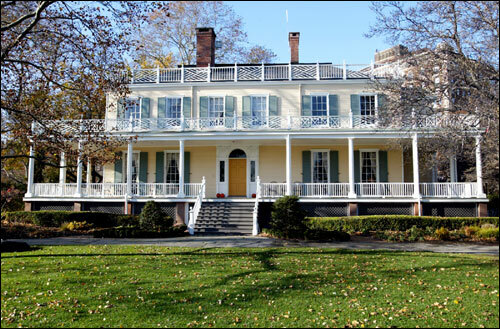 Ever since, Gracie Mansion has been the official mayor's residence--until Mike Bloomberg. He has chosen to remain in his own East Side town house. In truth, I think the multi-billionaire Bloomberg is the first mayor for whom Gracie Mansion did not represent a step up in living quarters! In the 1960s, Mayor Wagner's wife Susan despaired of the ceremonial intrusions upon the family's quarters. The city then hired the great Mott B. Schmidt and John Barrington Bayley (co-founder of Classical America) to design the Susan B. Wagner Wing, which is in fact the most publicly visible part of the house. It is a superb piece of neo-Georgian architecture--I daresay that judged purely as architecture it excels the original house. Using a similar formal vocabulary though in no way aping the style of the original, the new wing was the most absolutely right piece of architecture in New York in that benighted (for architecture) decade. It was even praised to the skies by Ada Louise Huxtable, the arch-modernist architecture critic of the New York Times. 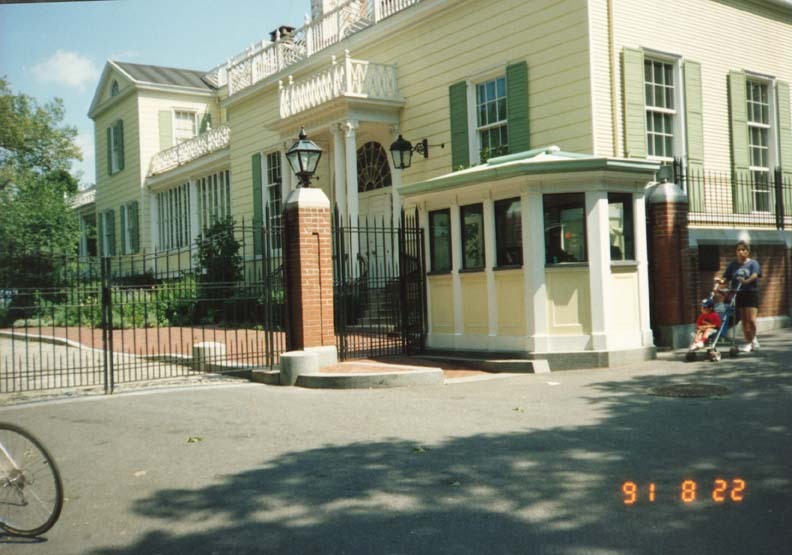 One wonders how the city would add to Gracie Mansion today. Would Mayor Mike hire Renzo Piano? It's not a far-fetched notion! Then again, for the inside, at least, the mayor had the taste to bring in Jamie Drake, an eclectically talented designer who has done marvelous and apposite things with the house, now used largely for ceremonial functions. Hear what Drake and Stern have to say, Wednesday, at 6:30, at 170 East 70th Street, between Third and Lexington Avenues. To reserve, call (212) 730-9646, extension 109. The lecture is free for ICA&CA members and for students and faculty of the NYSID, $15 for the general public. 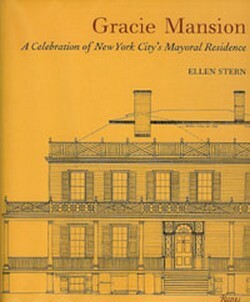 Ellen Stern is the author of Gracie Mansion: A Celebration of New York City's Mayoral Residence.